I just had a brief glance at my resume and am pleased to say you have made me look really good! It's crazy to see how well you summarized my life's work. You have a wonderful talent. Thanks so much and once I have time to look more closely to see if it needs any tweaking I'll let you know. The resume looks fantastic!!! Wow! I’ll take a closer look and advise of any changes but honestly, it looks really great and represents my background well. I wanted to follow up with you and let you know how the job search is going. I've gotten several positive feedback on the resume and had 3 interviews. I believe I closed the last one, but still waiting to hear from RBC. Articulate your value proposition in a compelling resume. Resume Writing for Executive to Senior Leadership Position (C-Suite). As an experienced executive, your resume needs to be influencing and persuasive through its content and structure to convince an employer that you are the right candidate for the job. We are committed to working with you (one-on-one) to deliver a top notch resume that will impress employers and generate results for you. Resume Services on this page is for customers in the United States. U.S. customers pay no tax on services provided. All Prices are in U.S. Dollar. Call 1.877.212.54441.877.212.5444 or email us for a free resume critique. We provide two levels of Resume Writing Services—Editing of Existing Resumes and Complete Writing (or re-development of your resume). Although both Writing Services involve a review of your experience, skills, accomplishments, qualifications, etc. (through a one-on-one discussion or telephone interview with one of our certified resume writers); the Complete/Full Re-Writing Service involves a more thorough analysis of your career history and achievements, in addition to reviewing of documents such as performance appraisals and job descriptions. Targeted career related research is also conducted to identify employer hiring requirements in alignment with your job target or career areas of interest, as part of the Complete Writing Service. We employ a strategic resume development framework that incorporates resume writing best practices, including resume keywords, industry terminologies, job-specific phrases, etc. to produce an outstanding resume that will generate results for you. Obtain more job interviews and close your next offer of employment in a shorter time frame with our expert writing services. We guarantee that you will be 100% satisfied with your resume and our service. 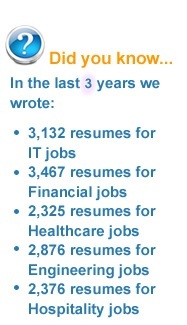 Throughout our 25 years of successful resume writing history, we have written/enhanced over 150,000 resumes across a vast array of professions for clients globally—enabling them to generate multiple interviews with top employers leading to offers of employment and career growth opportunities in a much shorter time frame. Moreover, our writing expertise and 1-on-1 personalized service will get you coming back (as did thousands of our clients) for resume and career guidance as you progress through each successive growth stage of your career. 1.877.212.54441.877.212.5444. Discuss your resume with one of our expert resume writers and get answers to all of your questions right away. Email Us Anytime with your questions…24/7. Get detailed answers to your questions via email. Quick turnaround time. Not getting results with your resume? Send it to us for a free critique by one of our professional resume writers and career experts. Office Hours. Speak with us in “real time” during office hours (9:00am to 5:00pm Monday to Friday) toll-free in North America. A deposit of 50% is required to start working on your resume. Same day Service (24 hours) can be arranged for an additional fee. Call us at 1.877.212.54441.877.212.5444 or email for more details. Please note that a price quote will be provided once we have reviewed the work to be completed. If there is a price difference, the resume consultant will inform you upon the conclusion of the resume consultation process for your approval and go ahead. The resume consultation is free. Please read more on our payment methods and terms. United States (U.S) customers save 13% as there is no sales tax payable on any resume writing services provided by Resume World, Inc.